The ruined Transaero airline cancels 76 flights appointed to October 16, the company press service reports. The complete list of the cancelled flights is published on an official site of "Transaero". «Other flights of Transaero airline on October 15 previously are carried out according to the schedule. In case flights are cancelled, the Transaero airline call center without fail will make the notification», – is told in the air carrier message. Transportation of passengers of the cancelled flights will be carried out by flights of the companies of Aeroflot group under the SU code. 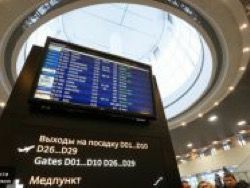 In the company noted that to transients of the cancelled flights delivery to the destination with joining at the Pulkovo or Sheremetyevo airport will be provided. Let’s remind, "Transaero" was able to bankruptcies in an early autumn. Together with leasing obligations its debts came nearer to the sum in 250 billion rubles. On October 13 the president of the Russian Federation Vladimir Putin charged to carry out of all obligations of "Transaero" to passengers, and also to employ the staff of airline. According to him, the labor staff of airline totals more than 10 thousand people. Late it became known that the Federal Labor and Employment Service opened special base of vacancies for the staff of the ruined airline.